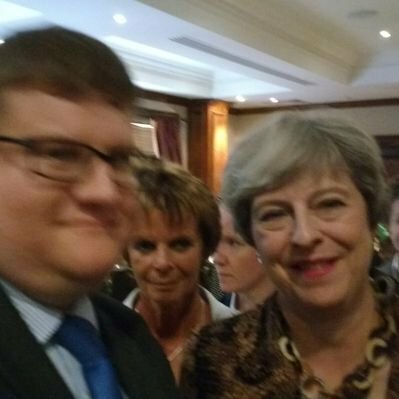 The blurry man on the left is Chris Stevens, a Tory councillor who pretended to be a member of the public to deny the devastation that Conservative policies have done to the sick and disabled people of the UK. The woman on the left will soon be an EX-prime minister. Some people – and I use that word mockingly – in the Conservative Party simply don’t know when to shut up. Two cabinet ministers have lost their jobs within a week (Michael Fallon and Priti Patel), and been replaced by shambling inadequates. A third – Boris Johnson – is set to follow at any time, due to his own arrogance. The minority Tory government is under attack for its failure to address appalling levels of tax avoidance by the very rich, for its failure to make any progress in Brexit negotiations, and for its indifference to shocking levels of sexual harassment among its own MPs. This is the moment a ‘plant’ in the audience of the BBC’s flagship political debate show Question Time decided to revive the debate over the thousands upon thousands of sick and disabled people who have died because of Conservative policies to restrict state benefits. The response on the social media has been overwhelmingly opposed to Cllr Stevens and his ignorant assertions. News stories detailing the deaths of the sick and disabled, dating back several years, have been brought back to light. The Department for Work and Pensions considers these stories to be anecdotal, and therefore uninformative about the overall situation. But the DWP – the only organisation in a position to track that overall situation – deliberately refuses to do so. How can the government claim to be doing its best for the sick and disabled people when it is putting those with long-term degenerative conditions – who are never going to improve – through pointless reassessment procedures? The claim that their benefit award would then be tailored to fit their needs is a lie; many people don’t even get enough to survive. That is the “conscious cruelty” of the Conservative government’s policy – the claim to be doing good when in fact doing harm, and the huge effort to hide the evidence. After Cllr Stevens’s outburst on Question Time, This Writer received multiple requests for my own perspective on these issues. I can do no better than to refer you to my previous articles. That information was only published as a result of a Freedom of Information request by Yr Obdt Srvt – the same request that showed 2,400 people had died in a two-week period after the DWP decided to deprive them of their Employment and Support Allowance. The DWP had tried to avoid publishing the information and had to be forced to do so by the Information Commissioner. Bear in mind that at the time the information was released – August 2015 – the number of deaths per week was not 90, as has been suggested after last Thursday’s Question Time. It was closer to 600 per week. The DWP has been found to be directly responsible for several deaths, but no prosecutions for corporate manslaughter have taken place. Why is that? Read some of the evidence here: Deaths caused by the DWP: Will this be the fourth CONFIRMED case? How about the massive increase in mental illness caused by the Work Capability Assessment, that caused 590 suicides – that were, of course, denied by the government? Perhaps I should post links to all the other articles I’ve written on this subject over the last nearly six years? There have been hundreds. The evidence demonstrating Tory cruelty isn’t “inflammatory rubbish” – it is thoroughly documented. I scored 4 points for help and 4 points for mobility. I have Ebstein’s Anomaly, Hypertrophic Cardiomyopathy and Meniere’s to name just three. I won’t bore you with how I try and cope. I received my PIP letter today and report on how the DWP Operator came to her conclusion has kicked my very soul. I will be taking this all the way to Tribunal. To say the very least I am shell shocked. On the 5th December I will have lost my £320 per four weeks DLA. After my bills I will need a further £87 to feed myself. What is unbelievable is the absolute lies and cherry picking of words from my PIP questionnaire and my face to face is mind blowing! Theyou will not kill me and I will win this because I have truth on my side! I believe this thoroughly unpleasant character is ex-UKIP turned Tory. Says it all really. Life expectancy in England and Wales has flatlined since 2010, after about 150 years of it rising steadily in every decade. The ONS has had to revise its life expectancy projections downwards after only 3 years, but only admits what it has done in a footnote to the current report. There were 40,000 more deaths than predicted, in the year to June 2017. On the bright side, the Financial Times points out that pension funds (and they only looked at a few of them) have had their liabilities reduced by £310 billion since 2010.